Inviting a stranger into your home can be an uncomfortable circumstance—regardless if they seem like a threatening or suspicious person. Unfortunately, for repairs, maintenance, and locksmith services often you are forced to give a person who you don’t know access to your home. We’ve all heard nightmarish tales of those posing as reputable locksmiths, coming back hours later to rob a home that they just serviced. Fortunately, this doesn’t happen all the time. However, hearing just one instance of this happening can be enough to make inviting a locksmith into your home a nerve-wracking experience. We at Affordable Locksmith of Texas understand your reluctance to schedule needed repairs or maintenance appointments and so hope to give you reassurance that there are some locksmiths who are more worthy of your trust than others. Bonded, insured, and certified locksmiths, in most cases, are industry professionals who can be trusted and won’t put your home in danger. Keep reading below to learn more about these distinctions. A bonded locksmith tells you two things about the locksmith that you are entrusting with your business. A bonded locksmith is one who has purchased a bond. Usually, when a locksmith purchases a bond, there are some conditions and terms associated with it, and the bond itself works similarly to insurance. So, if you hire a bonded locksmith, and unfortunately they damage your property, the locksmith will easily be able to pay for the damage. 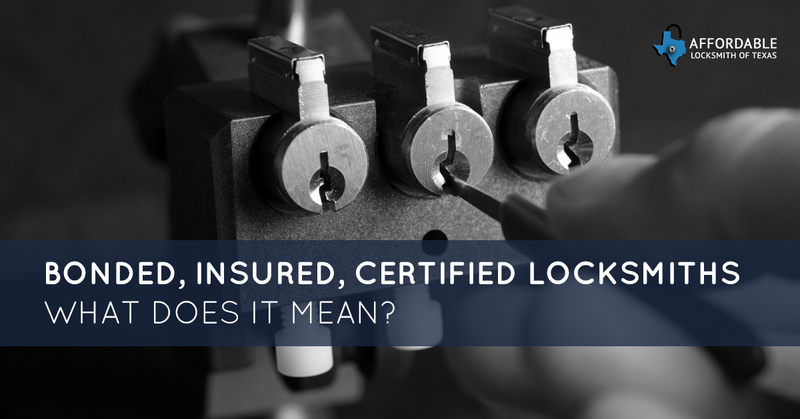 An insured locksmith carries even more legitimacy than a bonded one. An insured locksmith has liability insurance, and purchasing liability insurance isn’t a small investment. A liability insurance policy protects both parties involved—the locksmith and the client—and will usually be for the amount of $250,000 or more. When a locksmith carries insurance you can rest assured they they are fully invested in their legitimate business and not a shady side hustle. A certified or licensed locksmith will be one that you can trust to know exactly what they are doing for they will have received education from an accredited school or association. Certified locksmiths will have learned not only the technical aspects of their job, but also the principles and history of their profession. If a locksmith is licensed or certified they are fully invested in their profession and, to receive their licensing, will have had to undergo a background check. They can not have any bad marks on their record, making them the most trustworthy source for locksmith services. The local locksmiths of Affordable Locksmith of Texas are licensed and insured so you can always have peace of mind when you schedule a locksmith service with us. We truly care about our clients in Spring, Texas. We offer 24-hour locksmith services for both residential and commercial clients; in addition, we provide car locksmith services and emergency services. You can rest assured that when you contact us and inquire of a service that we will respond within 15 minutes. We understand that especially if you are locked out, that you need a locksmith in Spring who you can rely on. If you want to learn more about Affordable Locksmith of Texas and the locksmith services that we offer to clients in the Spring-area, visit our website. Have questions? Contact us with any of your questions!